An easily forgotten medium in a world with an attention span of a goldfish obsessed with blogs and spoon-fed easy to digest hors d’oeuvre of information. A magazine can be so much more than merely a collection of writings and much bigger than the sum of its parts: A coherent entity that unfolds its flavours not just with each new issue but also over time. Layout, design and being visually appealing are part of the deal, sure. It can anchor and frame content. The voice of a magazine can be created through the editors’ choice of approach to curation, layout and contextualization of the articles – a voice that needs to be clear and leaves not too much white space around why certain topics are dealt with in the issue in question in that exact order and individual context. Not forcefully trying to reinvent the wheel, desperately trying to be the first in line but keep an eye on what is current. Not indulge in nostalgia but appreciate things and ideas that stand the test of time. The voice of a magazine is what makes it unique. Great publications take a stand without imposing a point of view on its readers, yet their approach might not be for everyone. Smith Journal is released every three month and, in a nutshell, contains stories about weird science, offbeat history and ingenious design. The minds behind Smith want to create something they'd be happy to read themselves. Something that bridges the divide between makers and thinkers. Something that informs and is inspired by their own curiosity. 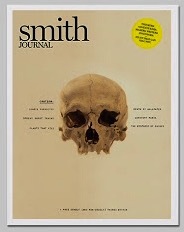 Each issue of Smith Journal has its own overarching design sensibility, clear typography, a global perspective and provides a reading experience with its high quality print and paper. You know a good magazine when the way it seamlessly combines unobtrusive advertising with content in an integrated manner adds to the overall experience instead of disrupting it – a magazine that you are likely to hold onto.